Have you ever found yourself in certain parts of the Old Testament and wondered to your yourself, "Who actually are those Moabites?" And while we're thinking about this, who are the Ammonites, the Amorites, the Jebusites, the Edomites - even the Canaanites - and countless other groups of people who never seem to be favourably disposed towards Israel and whose names end in "-ite"? There are some passages in Genesis that are hard to read because they contain lengthy lists of long names of people and places that are foreign to the eye and hard to pronounce and maybe, just maybe, we skip over them. But in doing so we miss out. As it happens these passages are rich with background information. For example, imagine if you knew that Ham - he was the son of Noah who looked upon his father's nakedness (a big no no) and then gloated about it (worse and worse) - was the father of Cush, Egypt, Put and (wait for it) Canaan? Egypt's descendants (there's quite a list of them) include the Kasluhites from whom (wait for it) the Philistines (thinking of Goliath here) came. And Canaan...well Canaan was the father of Sidon and of the Hittites, Jebusites, Amorites, Girgashites, Hivites and various others, all of whom gave Israel a hard time during the times of Joshua. That is, all the little nations that occupied the Promised Land. All of that lot is just from the family line of Ham, son of Noah. The son who did not honour his father. Doesn't just even knowing that change the way you read a whole lot of the Old Testament? And then there are the Moabites and the Ammonites. They gave Israel quite a bit of grief. Well, remember Lot? After he escaped from Sodom with his wife (who was then turned to pillar of salt...but that's another story) and his two daughters, the three of them lived in the mountains because he was afraid to stay in Zoar. (Let's not worry about Zoar at this point. The main point is that they were hidden away in the mountains.) The girls quickly worked out that there were no prospects for furthering the family line so they (ghastly bit) made their father drunk and took turns to sleep with him and both had a child. Those children were Moab (father of the Moabites) and Ben-Ammi (father of the Ammonites.) That changes the way you read about Moab and Ammon. Edom. The father of the Edomites was Edom (no surprises there), otherwise known as Esau - the twin brother of Jacob. Now if you know the story of Jacob and Esau then you won't be surprised that every time the nation of Israel asked the Edomites for a favour the Edomites said no, in fairly strong terms. I haven't even mentioned the Midianites, the Ishmaelites and a host of others. But virtually every nation and people group the Israelites encounter as they make their way towards Jesus get a mention in Genesis. And knowing the backstory of each of these people groups gives depth and understanding to the narrative. Take an hour to read over the words of those passages (including all of those hard to pronounce words) and see how many names and places and people groups you recognise. It probably will take an hour but this is an investment for the future. And be in awe all over again of our Sovereign and loving God who has planned all things and is in loving control of all things. I'm about to go semi-public on this so let it be know that you first heard it here. The grid. Two or more sets of disposable plastic plates - each set needs to be a different colour and I have had four sets successfully on the go with large groups. The teams take turns to put a plate anywhere on the grid. 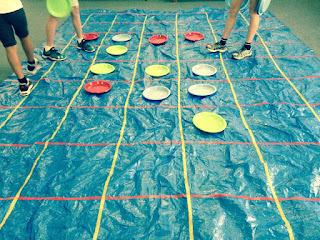 The aim is to get four plates in a row - horizontal, vertical or diagonal - while blocking the other teams' attempts at doing the same. Plates can be placed anywhere on the grid. Make it three in a row with younger children. The actual game of "Connect Four" is played vertically and coins drop to the lowest level. 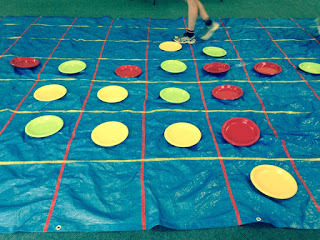 With older children pretend that gravity is involved and work from the baseline, building the puzzle up, rather than placing the plates anywhere on the grid. The grid. 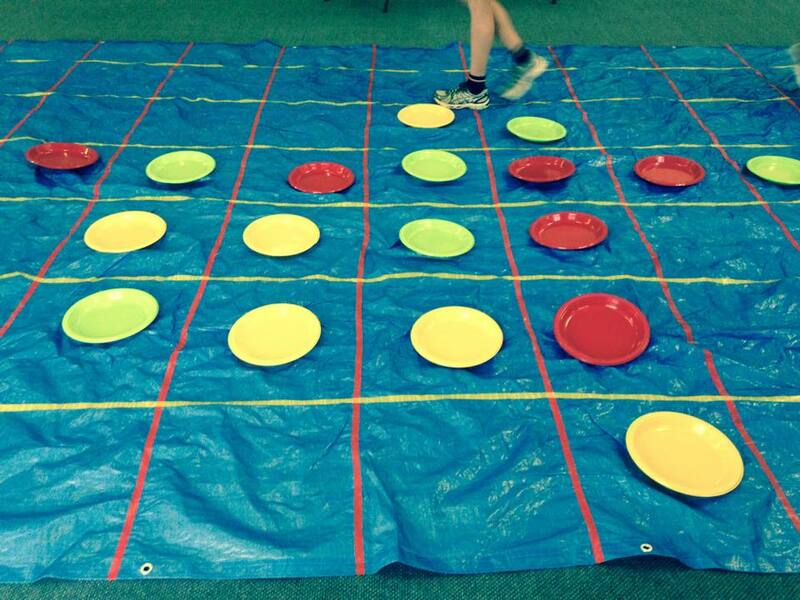 A small copy of the grid with a trail marked from one side to the other - kept out of view from the children. A whistle. The aim of the game is to step, square by square, from one side of the grid to the other. The children take turns. If they step into a square and it's on the pathway then there is no sound and they are free to take another step - vertical or horizontal. If they step off the track the leader blows the whistle and the child is out. The next child tries to retrace the footsteps and get a bit further along the track. The winner is the one who gets right across the grid following the path. The leader can tell them where the starting square is...or not. Play in teams. The children still take turns, team by team, but during their turn they will get some assistance from their fellow team members. 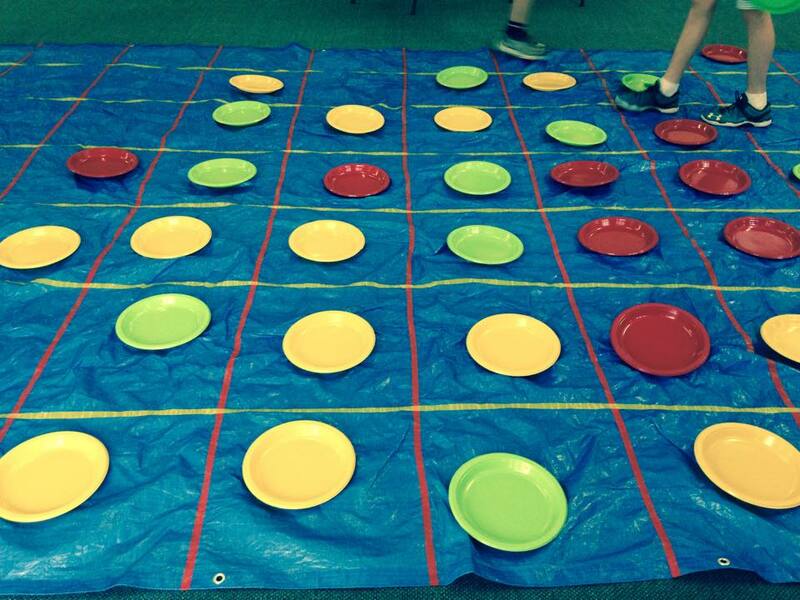 These games have been thoroughly tested and loved by Sunday School, Youth Group, after school Kids Club and Holiday Bible Club groups, a school class and a group of adults over the last twelve months. Yours to use. You're very welcome.